Gary is embarrassed by his own geeky ways and that of his family. His Dad tells him about an ancestor named Red Brick Wallace, who took down four gunfighters in the Old West. Gary asks Lisa if they can meet him. She zaps them back in time, but she immediately loses her powers because there’s no electricity in 1895. When they find Red, they discover he’s just a spittoon cleaner and Gary is disappointed. They run into a band of outlaws at the saloon, the ones whom Red is supposed to take out. However, Gary is confused because Red keeps trying to keep the peace. 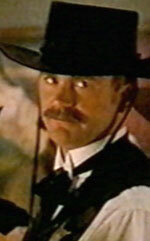 Chett makes an appearance as the crooked sheriff, who’s in league with the evil gang. He makes a great entrance through the saloon doors with the sun shining in behind him. He saunters in cockily and he’s wearing a cowboy hat, a fake mustache, black cowboy pants, a black vest and a white shirt. He looks hot, really hot. So hot that he strikes his match on his sheriff's badge to light his cigar. His flinty opening line? "I heard shootin'. Anybody dead?" When trouble breaks out in the saloon and the bad guys threaten Red (again), the sheriff is called upon to stop them. He gives them a warning: "Remember the rules... if you shoot 'em, you bury 'em." The leader of the gang is about to shoot Red, but Lisa distracts him -- and the rest of the saloon -- by suddenly appearing as a showgirl, singing and dancing to an 1890s rendition of Madonna's "Like a Virgin." Soon, she has the whole place disco-ing. Sheriff Chett shows off moves that we'll see again in "Pirates!" But trouble soon brews again. The gang challenges Red and Gary to a shootout at noon. High noon. Just before the gunfight starts, Sheriff Chett rushes to the scene. "What's going on here!" he bellows. Could he possibly be keeping law and order? Pffft. No. "You can't start without me," he scolds. Then he pulls up a chair and licks his lips in anticipation. It doesn't look good for the Wallace clan, especially when Red takes off his gun belt. He steps up and still tries to keep the peace. The bad guys decide they don't need to shoot -- they can kill him with the bare hands. But then they step on an electric grid that Lisa and Wyatt concocted (using a bushel of potatoes and a bicycle). Red takes one swing and they're all zapped off their feet by the electrical charge, making it look like Red's the hero. Sheriff Chett congratulates Red and pretends to give him his badge, then yanks it back. “You? Sheriff? What am I, loco?” he says, cackling. The townspeople grab him and haul him off, causing him to drop the badge. The Wallace legend lives!